The new school year is almost here! It is time to get back into the routine of class, study, sleep (or not), and repeat. Most students love to study at the library. It is free of distractions, super quiet, and full of resources to get your homework done right. Here’s the catch – it’s called ‘home’ work for a reason! There are some benefits to staying in your apartment instead of going to the library. 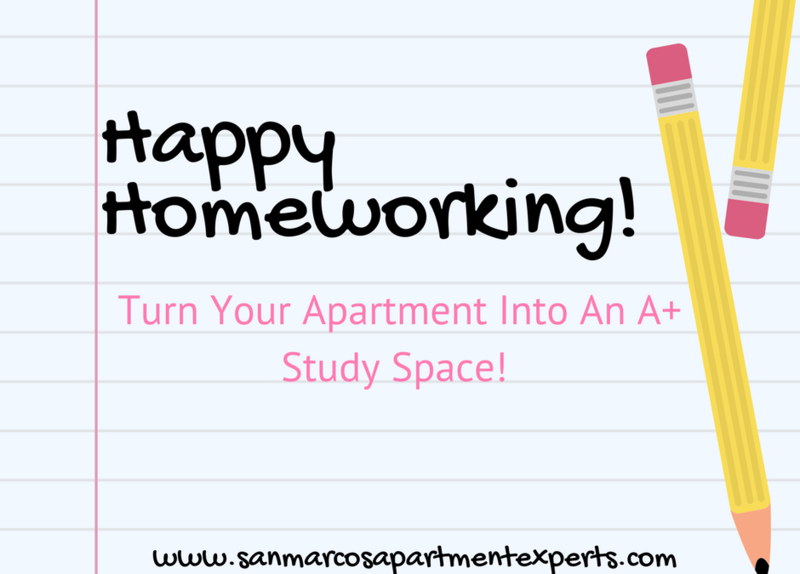 Check out some of our favorite tips on getting your apartment study session ready! One of the best ways to be productive at home is to get organized! It is important to have a designated work space that is clean, functional, and free of clutter. This will help with staying focused and keeping a clear mind. Check out these desk organization ideas from Apartment Therapy for inspiration! The best perk of staying home to study is easy access to snacks! It is easy to forget to eat while cramming for an exam or writing a paper. Staying at home to study provides easy access to the kitchen for study breaks and brain food. These snack recipes are quick, healthy, and meant to provide a great boost of energy to make the most of any all nighter. One of the reasons students like to study at the library is the quick access to technology. The campus library typically offers printing, copying, internet access, and study nooks. However, most apartments offer this too! Many apartments around San Marcos have business centers for their residents with free printing, scanning, copying, and computers to work on. Some apartments even have private rooms for rent with dry erase boards and conference tables for study groups. If these amenities are important to have, consider using an Apartment Locator to help you find your next apartment. Locators are knowledgable about services and amenities that are offered by different apartments, and can help you find a property that suits all of your needs. The start of the school year is a new beginning. In order to get a true fresh start, a new apartment is essential! If you are looking to move before school starts, give Apartment Experts a call at 512-262-9887! We have access to the largest and most up to date database of available apartments. Our services are completely free! We would love to help you find your next home. Happy studying!